Defining the aspects of mobility that function well or need improvement is a critical part of decision making for large cities. 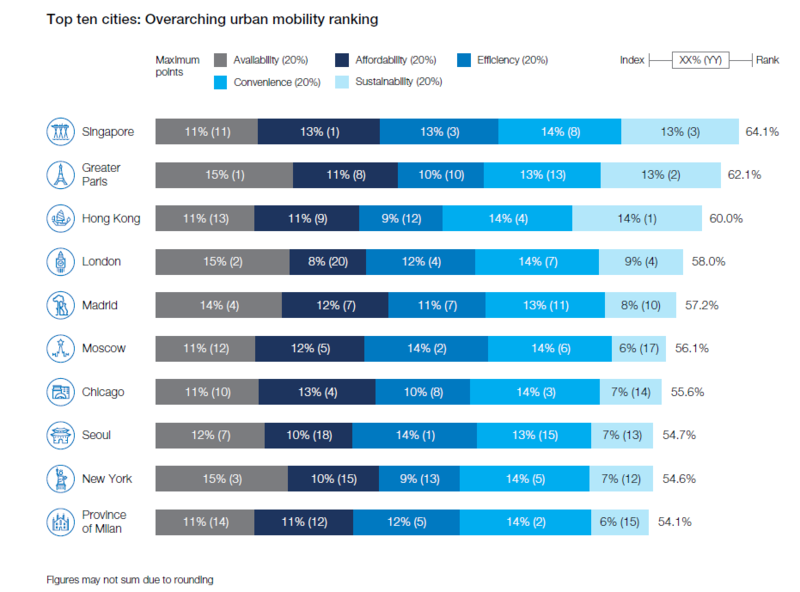 Mobility is one of the most critical components of urban health. How a city’s residents get to their places of employment, whether they get their safely, comfortably, and affordably, all figure into the overall economic wellbeing of a metropolis. 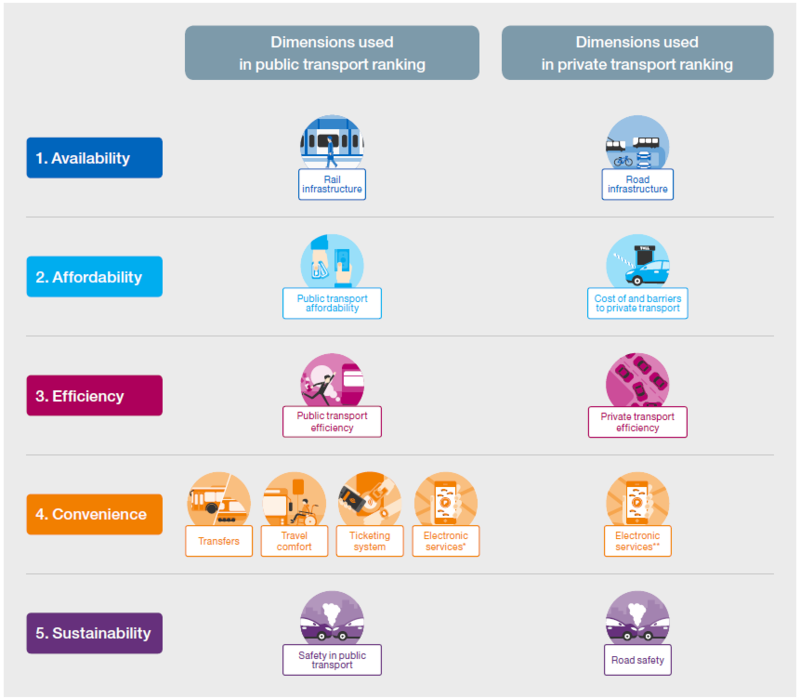 The report “Elements of success: Urban transportation systems of 24 global cities” by McKinsey Global Institute seeks to identify the most important aspects of mobility that make transit systems work, or not, and to compare them across 24 global cities. The methodology behind this research is unique in its approach, in that it analyzes more than 50 statistical indicators, leverages geospatial data, surveys residents, and taps into the expertise of dozens of experts to present an authoritative picture of urban mobility. Since we believe that all five of the dimensions we analyzed are equally crucial for shaping the passenger experience, the same weights were assigned to each of them in overall ranking. Interestingly, there is no absolute winner that scored maximum points or took first place in all dimensions. Each of the leaders has its own strengths and weaknesses, and the most balanced cities with several distinctive achievements rose to the top. Even the leading cities in terms of cumulative results score no more than 65 percent from a 100 percent maximum, which implies that every city has its own areas for improvement. If we were to derive the formula for an ideal transport system, it would be as available as in Paris, as affordable as in Singapore (where public transport is very affordable despite high barriers for car usage), as efficient as in Seoul, as convenient as in Toronto, and as safe and sustainable as in Hong Kong (see Exhibit 2). For additional details, please download a copy click on the link below.